The majority of Americans realize Trump tells lies. Often really "bigly" lies that leave people gasping with astonishment at his departure from facts. Not too many people are aware of what a liar and racist President Theodore Roosevelt was. Don the Con, aka Liar-In-Chief, merely continues Teddy's tradition. 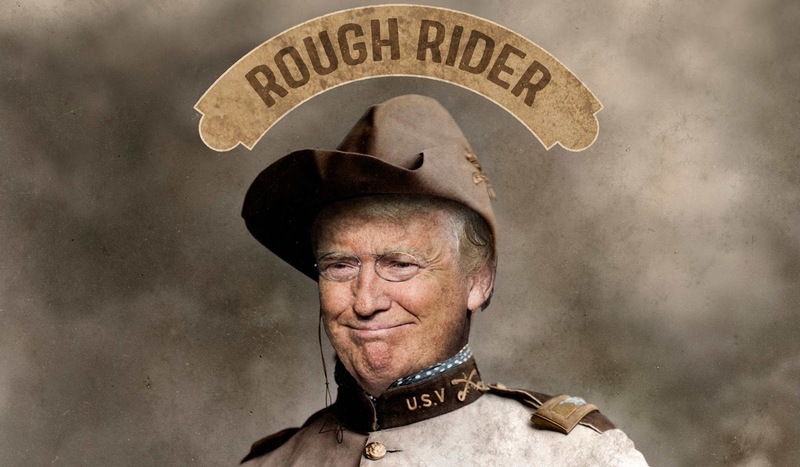 Most people associate Roosevelt with wearing funny round-rimmed glasses and charging up San Juan Hill with his Rough Riders in a blaze of glory. Sorry. But that story kids read about in school history books about "Teddy" riding up the hill with his Rough Riders and winning the day is a blatant lie. It's a "total fabrication" according to Jerry Tuccille, author of the recent book, The Roughest Riders. In the link below the author talks about what a racist Roosevelt was and what really happened at San Juan Hill. In summary, Teddy had a group of "newsmen" (alternative press) who followed him around like adoring fans/followers. They staged photos and wrote fictional accounts about Teddy's bravery. Roosevelt was a con man, like Trump, who knew how to market his brand. Fox News is the latest in a line of alternative news that has been around us since the birth of the Republic. The whole Fourth Estate is mainly mainstream news, but we have to recognize false news has also been part of our history. Trump is desperately trying to do his best Teddy imitation but instead of charging up a hill and winning, he's been retreating down the hill trying to fend off a pissed-off American public.